A breath of the past century meets modern minimalism. Both art styles harmonize perfectly with each other in this deck of cards. Created by Daniel Schneider. Having been a huge fan of all kinds of playing cards from the last century, it’s been a goal of mine to create a deck of cards that combines my love of minimalist art and detailed designs from the past. 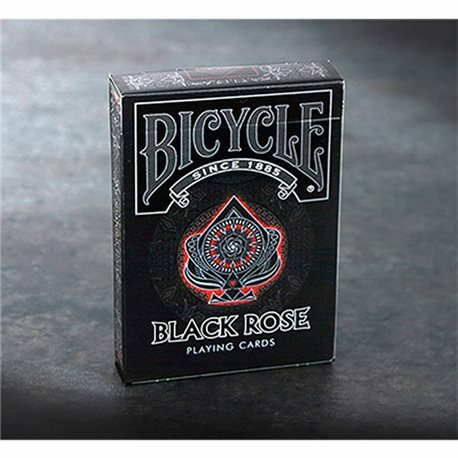 The Black Roses Playing Cards were born from that idea." - 1 double-backed card. - 2 of Diamonds duplicate. - Personalized courts. - Bicycle paper stock. Air Cushion Finish. - Printed by the US Playing Card Company. The Black Roses don't attract too much attention at the first glance. A positive feature, especially for magicians who don't want their audience to believe that it is a tricked deck. However, all the little details reveal themselves at the second glance. A rich and intricate back design composed of clean and smooth lines, making it very interesting to look at without feeling overwhelmed by excessive and unnecessary clutter. Personalized court cards with modern elements take the dust off the original standard cards without destroying the classic look and feel. For example the Queen of Clubs with her long brown hair, holding a Black Rose in her hands. • The cards are poker size.